The trip up to Williamsburg, Virginia for MOG 47, June 16 – 18, was great. The 1980 Plus 8 ran well the entire way! There were 19 Four Wheelers and 1 trike. There was an even mix of Plus 8’s, Plus 4’s, Plus 4’s 4 seaters, and 4/4’s. The predicted rains kept a lot of people from driving their Morgans. They drove their tin tops. The Concours on Saturday morning was accompanied by drummer and the bag piper. The Saturday rally was fun even though rain was eminent. We drove with another couple in their tin top. Sure enough it rained buckets and the Morgan’s that drove the rally got soaked. The Awards Banquet on Sunday night drew approximately 60 people. The food was very good. To round out the night we won two awards! One for the longest distance traveled and the other for best early Plus 8. Bruce Trabb did a great job as chairman of the whole event. We spent two days in Colonial Williamsburg seeing the sights and then headed back to Florida. The first day of our trip back was easy as we stopped in Kinston, North Carolina at the Chef and the Farmer Restaurant for supper. The food was New York City restaurant style and wonderful. The second day driving was a bit longer, as we stayed to the back woods. We were hampered somewhat by 4 different rain storms. Another great Morgan weekend! The car ran great and we won two awards.! Can’t beat that!! 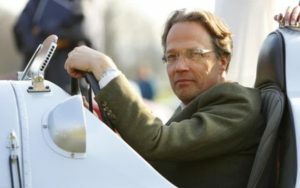 Charles Gordon-Lennox, Earl of March and Kinrara, is one of Britain’s foremost petrolheads and opens his house and driveway this weekend for the annual Goodwood Festival of Speed. The event draws many of the world’s most storied and valuable sports and racing cars, and many of their original drivers. As for Lord March, he loves American hot rods and has owned many Porsches and Ferraris, but the motor closest to his heart is an elegant old Lancia. It was a 1936 Morgan 3-wheeler , because my parents were determined to keep me off motorcycles and it seemed like a compromise. I found it for £200, and it was lethal. It was made of plywood and had a wobbly back wheel, which actually fell off once as I drove to my girlfriend’s house in the next village. Yet I loved it; I was 16, in my leather jacket and goggles, and off I went. Morgan has always divided enthusiasts. Some regard it as being as quaint and charming and as quintessentially English as drinking warm beer in a queue to watch a test match while complaining about the weather. While an almost equally matched cohort view it as a living anachronism, one that builds woefully outdated cars for people who routinely wear tweed and say “tally ho!” without irony. I used to be one of the doubters, unable to see much appeal in the idea of a factory fresh classic ticking every cliche and harking back to an age when cars just weren’t very good. Morgans had wooden frames and wire wheels and leather straps, plus engines that delivered more rort than sport. The fact people were prepared to spend serious money on them, and to often wait years to take delivery, just added to this sense of eccentric madness. But then I drove one, and the world suddenly shifted. Having a go wasn’t easy; while the company was more than happy to let journos experience its more modern (and much more expensive) alloy bodied cars, there was no inclination to let us near the ‘classic’ side of the range. Likely in anticipation of all the rude things we’d say. I was sent to the factory to drop off an Aero 8 that had been used in a magazine story and saw a gleaming 4/4 demonstrator parked outside the office. Out of curiosity – and probably the desire to prove my prejudices right – I begged a go in it. For the first five minutes, it was as bad as I had expected. The suspension crashed over everything, the bodywork shook like a shivering dog and – thanks to a shower – the fabric roof leaked water onto my lap. Yet, despite its flaws, it was also utterly charming – keen, benign in its responses and delivering the sort of sensory overload that made 45mph feel like double that. I returned to the factory wearing a startled grin – one I imagine they see quite often – and I’ve been a fan ever since. Although Morgan makes several classic models, the 4/4 was where it all began. Quite literally, its name denoting the fact that it had both four cylinders and four wheels, a novelty for Morgan in 1936. There were two production breaks, one during World War II and the other in the early 1950s, with a sizeable gap between the Series I and Series II cars. But even if you choose to date the 4/4’s origins only to the launch of the latter version in 1955 it can still lay good claim to be the longest-lived car in the world. Many details have changed over the years, but the similarities are much more striking than the differences. Park a brand new Moggy next to its mid-50s ancestor and you could pretty much swap the plates undetected. Like Morgan’s other ‘classic’ models, the basic Runabout, the plusher Plus Four and the V6-powered Roadster, the 4/4 is built in the company’s traditional way. That means a steel chassis and aluminium bodywork, this mounted onto an ash frame. (That pub bore who insists Morgans are made entirely from timber is an idiot.) Suspension is the oldest of the old school – it probably still writes on a slate tablet – with sliding pillars at the front, a technology first used by Morgan in 1909. At the rear is a solid live axle, suspended between two elliptical leaf springs. Front disc brakes arrived in the 1960s, and the modern car uses a five-speed Mazda MX-5 gearbox, but the rest of the rolling chassis has barely altered over seven decades. The engine is the newest part of the car, and one that continues Morgan’s long tradition of using humble powerplants in its cheaper models. These days the 4/4 packs a 1.6-litre Ford Duratec, normally seen in lowlier versions of the Focus and C-Max. With 110hp and 104lb ft it’s unlikely to strain a dyno (although for contrast the Series II launched with a 1.1-litre Ford side-valve producing 36hp.) But the Morgan’s lack of pretty much everything means it remains impressively light; the 795kg kerbweight meaning it is pretty much an Edwardian MX-5. The secret of Morgan appreciation is to reset your expectations. The 4/4 can’t be fairly compared to a modern sports car, or even an elderly one. For anybody arriving from something more recent – statistically pretty much anyone – early impressions will mostly be of the car’s flaws, many of which actually add more character than they subtract. The lack of modern ergonomics are obvious from the moment you get in and slide legs into the tight-fitting footwell to discover the various awkwardly shaped brackets and extrusions you have to share it with. The steering wheel of our test car is a magnificent wood and metal Moto-Lita affair that looks as if it could knock out most of your teeth in an accident, and the column doesn’t adjust for reach or rake. The only concession for differently sized drivers is the ability to slide the seat. The cabin itself is nicely trimmed, with some vintage style clocks although modern plastic control stalks. There’s plentiful evidence that it’s been built by hand, from self-tapping screws to occasional bits of swarf. Dynamics are similarly Olde Worlde. The steering is unassisted, and vein-poppingly heavy if you try and turn the wheel when stationary. It lightens up as soon as the car starts to move, but only for the first half-turn or so of lock; add more than that and it’s back to being a workout. Precious little feedback gets through to the rim, with none of the chatter of a Caterham or a Lotus, and it also needs constant small corrections to stay on a chosen course. Grip levels are sometimes startlingly slight on the period-patterned 165/80R15 Continental tyres, with the front wheels locking on dry tarmac at low speeds under moderate pressure on the unservoed brake pedal. The Morgan comes from an era when driver aids were definitely for wimps. Yet Morgan has been doing this for long enough to want to keep its customers alive to buy more of its products. Once adapted to its foibles, and the need to keep a decent distance when following other cars, the 4/4 actually feels impressively secure. It feels like there’s more lateral than longitudinal grip, the chassis tuned to stay safe and predictable as the limits get near. Excess speed sends the front running wide, but there’s no matching sensation of looseness from the rear; even the combination of a low gear, lots of steering lock and an enthusiastic application of throttle doesn’t produce any feeling of slip on dry tarmac. This definitely isn’t a car for the ragged edge, or even a mildly unkempt one. Like riding a motorbike – or a horse – the best approach is to try and work together, anticipating risks before they arrive and deploying the 4/4’s modest power output to its best effect. With the roof down 60mph feels positively daring, and overtakes are a genuine achievement. The 4/4 isn’t fast, but it never feels slow. Indeed the engine suits the car almost perfectly. In Fords this is a utility grade powerplant, but the Morgan’s lack of mass lets it reveal a genuine enthusiasm. Throttle response is excellent, mid-range torque is solid and the upper reaches of the rev range deliver a very rorty soundtrack through the optional sports exhaust (which exits on the driver’s side to enhance its snap, crackle and pop.) The gearbox is an absolute joy as well, as slick and accurate as it is in the MX-5; it’s a shame the floor-mounted throttle pedal is so poorly mounted for heel-and-toe blipping. But it’s still one of those cars you change gear in just for the sheer hell of it. Morgans have a strange ability to distort reality, to win you over. After a couple of days you stop noticing how terrible the ride is, and how much scuttle shake the car exhibits over rougher roads. The pop-fold-pop fabric roof starts to make sense; with a bit of practice you’ll get the time taken to put it up or down under three minutes, and with only a couple of swearing fits. Hell, your legs even start to grow calluses where the sills and transmission tunnel rub, to the point they barely hurt. It’s proof of just how charming the car is, and an explanation for the cultish appeal that has kept it in production for so long. But there’s also the grubby business of money. Put simply, a Morgan 4/4 has, historically, been among the safest of automotive investments. 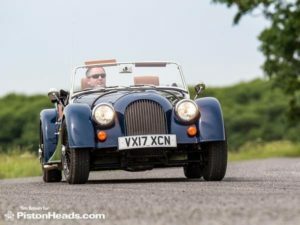 Back in the 1980s the combination of very gentle depreciation and a multi-year waiting list meant that Morgans were actually worth a premium for a couple of years after they were first registered. These days the waiting list has fallen to months if you want to specify your own car for factory build, and a glance at the Piston Head classifieds reveals there are even unregistered cars out there ready to buy. But a tasteful Moggy still holds onto value remarkably well, with a depreciation curve that – over decades – will ultimately turn and start to climb again. It’s entirely appropriate that a solid example from the 1940s or 50s costs nearly the same as a new one. Most car companies evolve at huge pace. Often, in the case of small sports car makers, too quickly. Look at the long list of British sports car makers through the ages and see how few are still trading; the ones that have endured are the ones with a loyal following and a product line-up that plays on a familiar theme rather than heading in radical new directions. As such, Morgan is the exemplar – a company which boasts fifth- and even sixth- generation employees, and where nothing changes unless it has to. While the 4/4 definitely isn’t a car for all tastes, it’s proof that tradition, craftsmanship and just being different can carry you a very long way. 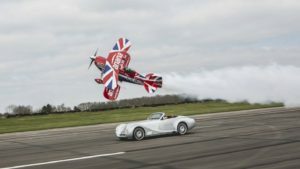 Continuing the positive momentum in the business, and as part of a long term strategy, Morgan Motor Company has hit yet another milestone in a record year, with the re-acquisition of factory land. At the Geneva Motor Show earlier this year Steve Morris, Managing Director Morgan Motor Company, announced a record trading year with a 14% revenue growth year-on-year. It’s the first of many positive steps planned in a long-term strategy for Morgan Motor Company under the guidance of Morris, the Morgan family and recently appointed Chairman Dominic Riley. In January 2006, the Morgan Motor Company sold the land on which the factory is built to fund product development in a sell and lease-back deal with Stirling Investments,a deal that enabled the company to develop new vehicles and implement new technology. The re-acquisition of the land follows a successful period of business development and helps to provide stable foundations for Morgan’s future growth plans. After a sustained period of successful trading and consolidation, Morgan Motor Company has now purchased both the Pickersleigh Road site and the Morgan Visitor centre. It’s a clear indication of Morgan’s commitment to its roots in Malvern, which for over 108 years has been the home of the Morgan Sports Car. The inclusion of the Morgan Visitor Centre in the land purchase secures the future of this destination as a popular tourist attraction, which has welcomed over 30,000 visitors a year since the official opening by HRH Princess Anne in 2009. The first ever North American Morgan Three Wheeler Convention. May 18 – 22 in Augusta GA. A long weekend (4 days actually) of activities for the greasy Morgan Three Wheeler enthusiast and another set of activities for the less greasy set. Lots to do. Lots of moving parts. Lots and lots . . . . darn impossible to keep up. Hard to believe that there hadn’t been a North American Morgan Three Wheeler gaggle before. Sharing knowledge about these silly beasts has been a problem for a good while. Certainly for me. What went where, and how, left me clueless most of the time. A newsletter about British doings with occasional practical articles, emails, photos and an online forum have definitely helped but unfortunately these two dimensional, text messages lost something in the translation. So with the Convention we brought folks together for the face-to-face contact and gave them direct access to the cars. This was far better, more three dimensional, or so it seems as was evidenced by the sheer volume of participants. We also planned activities for the ‘spouses’ (for lack of a better word). This meant that those that were not terribly interested in the greasy, and somewhat mystical, inner workings of these beasts had something more interesting to do. Much of what we planned for the ‘spouses’ involved Augusta itself – a trolley ride, a tour of the Woodrow Wilson boyhood home, the Saturday morning farmer’s market. One activity was needle felting, a handy-craft resulting in cute bits of fluff. I was told they were ‘hedgehogs’. Andrea took Lee Charlton’s needle felting session twice. I now have nightmares of hedgehogs. . . lots of hedgehogs overrunning the house. And of course, the dogs are not amused. The needle felting class was a grand success, with a single session expanding to three – so a big ‘thank you’ to Lee. We planned for 40 or so attendees and a dozen or so cars, but ended up with 70 plus attendees and 23 cars. I was in continual fear that all the complex planning for the event would simply fail under its own weight – the inability of the restaurants or other providers to satisfy our enlarged state. Well, I fibbed a bit about the quantities of participants and luckily the suppliers were able to meet the actual demand. It couldn’t have gone better. Even the weather cooperated. Hot and a bit humid, but no rain. Rain would have been a big problem. We were lucky all weekend. Breakfast on the hotel porch, each morning, was divine. Actually, we had planned the event around the parking garage, wanting somewhat of a hands-on experience with the cars. The parking garage, only one of two in Augusta, offered us shelter from potential rain or more likely, incessant sun, but the parking garage soon became irrelevant. The hotel ‘gave’ us three banquet/meeting rooms. Something I would have thought they would have charged us for, to use for the weekend. We ended up using these rooms for our technical seminars with only sporadic trips to the garage to emphasize some technical point, on an actual car. Air conditioning in these hotel rooms, given the warmth of the day, was much appreciated. We actually started each day with a morning meeting for all, in one of the rooms, to pass on the daily plan and highlight any communications we needed to disseminate. It worked quite well, but communication was the bane of the weekend. We set up a bulletin board in the lobby, posting the latest and greatest, but it was like pulling teeth to get folks to refer to it. Following the technical seminars and ‘spouse’ activities, our Friday involved a short, scenic drive through a number of the charming neighborhoods of Augusta. 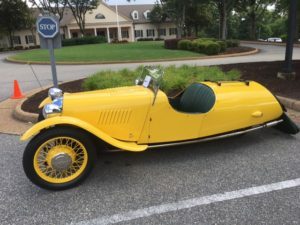 Massive houses with amazing grounds – each undoubtedly steeped in history – adorned the route and we paraded some 22 vintage Morgans and newer 5 Speeders into downtown Augusta, to Enterprise Mill. Enterprise Mill offered us a quaint park like setting for a small car show, a box lunch and a ride along the historical Augusta canal. Saturday involved vintage Morgan driving familiarization and test rides offered by the 5 speeder vendors who attended. We found a big parking lot at a local school that kept us off the public streets. Later in the day Graeme and Jenny Addie hosted the group for an evening dinner party at their home. Great food, great company and wonderful comradery. Certainly all good stuff and a highlight of the weekend. Another great Morgan gathering. Many thanks to the MOGSouth members who participated and hopefully they enjoyed their experiences in Augusta. It isn’t likely that I will be involved in the next one, however, we (Duncan Charlton, Graeme Addie and myself) learned a lot and will pass that on to the next set of folks that have the privilege (?) of planning and executing the 2nd North American Morgan Three Wheeler Convention.